Perfect, marvelous, fantastic, exciting, wonderful, terrific.....I could go on and on because ALL describe this past weekend in Newhebron, Mississippi! Where do I start??!! Let's try the beginning! I left Nashville at approximately 11 a.m. on Friday morning, Mississippi bound! I got excellent directions from the nice lady at the Mississippi Welcome Center. I became more excited with each passing mile! All 3 states (TN, AL & MS) had road construction, but even that didn't dampen my spirits! Add to this the weatherman's dreary prediction of rain for Saturday. You know what they say, "Neither rain, nor road construction shall keep a tried and true Marty fan from reaching her appointed rounds, oooops, Marty Party!" I arrived in Magee, Mississippi at about 6:30 p.m... 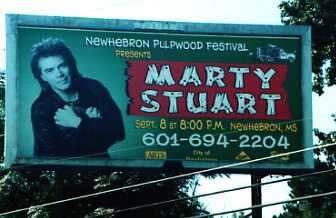 Passed a humongous billboard with Marty's smiling face publicizing the Festival. (Mental note: "Got to take a picture of that before I leave Magee"). Magee is somewhat larger than Newhebron, thus the reason for staying there. I had been told that the place for us to stay would be the Comfort Inn in Magee. So, I quickly checked in there! Once settled in, I set out to explore a bit.....especially since there was a Super Walmarty about 2 minutes away! I just HAVE to seek help for my Walmarty addiction. Do you suppose there is a support group of any kind?! Oh, well! Once back in the motel I spent some really fun time talking via cell phone to Cindy Allred and Lisa Phillips of Alabama. They were coming on Saturday morning! GOOD!!! It was getting better all of the time! I just love Cindy and Lisa! If you ever want true and loyal friends, latch on to these two gals! They're the best! ;-) I also heard Marty's "Aunt Myrtle" and her son, Dwayne were coming in from Marty's hometown, Philadelphia, MS. What more could I ask for....... besides better weather? As the day wore on the sky became more and more menacing....not good when you're going to an outdoor venue. At approximately 3 p.m.. Aunt Myrt and Dwayne arrived. They'd been to Jackson where Dwayne had purchased a new guitar. 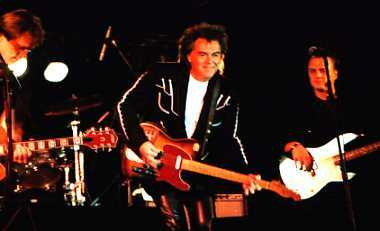 Dwayne's Dad was the one that taught Marty to play the guitar! And Dwayne sure can play too! Even with no amplifier, he sounded great. I could have listened almost all night, well, till Marty took to the stage anyway! ;-) We LITERALLY had just gotten their luggage inside the motel door when, whoosh, the sky just seemed to open up! This was NOT good......Lisa and Cindy were driving in this mess! I was frantic! Plus I thought of that evening. ("Please let it stop raining!!!"). After our 1/2-hour ride (that seemed to take forever since we were so anxious!) we arrived in Newhebron. Such nice folks! True Southern Hospitality! We quickly sat our chairs up in perfect position, and waited. Aunt Myrt and Dwayne went to visit a while with our Marty, so we also awaited their return. Marty's opening act, "Christy Rose", went on at 7 p.m......how was she? Well, you're asking the wrong person, my friends! I was too busy looking at my Marty watch, trying to sit patiently till our Marty took the stage at 8 p.m..
All too soon the show was over. Marty had sent word via Aunt Myrt and Dwayne that he'd see the other three of us after the show. So the five of us chatted with Brad, Gregg & Steve while we waited for that Mississippi Mudcat of ours! Les Banks is currently acting as Marty's road manager, and told us that Marty would be out shortly. Les is also Marty's "sound guy", a job nobody can do like Les! Les is such a doll! Myrtle had brought Marty a huge supply of butterbeans to take back to Mom Hilda, and we were really trying to make sure they were on the bus......Marty and Les kept trying to assure us, "The beans are on the bus!". Hahahaha!! As the boys got on the bus and headed back to Nashville, the five of us headed back to Magee, and tried to figure out what food establishment was still open. Not much! McDonald's, Wendy's, Walmart Food Center, and Sonic......we opted for Sonic. Dwayne stayed at the hotel and just told us, "Get me anything except chicken". We could handle that request! Back at the hotel, we talked happily till about 1:30 a.m., and then called it a night... to "Dream, Dream, Dream" of the night's super show! The weather you may ask......well, I told you God loves Marty.....the stars and moon were shining bright on our darling Pilgrim.....all was right with the world! The next day....off to Philadelphia, Mississippi!!!! But first......many thanks to the Newhebron Activities Club for having our Marty and us! 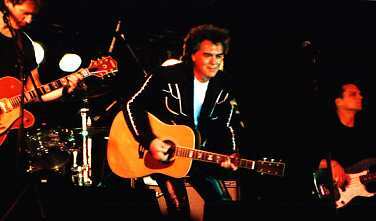 They showed us what Southern Hospitality truly was, and these Marty fans are forever grateful! Mississippi, these "Myrtle Mutts will be back!"